KIEV, Ukraine -- On February 24 on three Ukrainian television channels, President Viktor Yanukovych said, “There is a law and it should be observed, I believe. And a fight within the law is a fair fight. And whoever breaks these rules should be punished for it…"
We should remain skeptical of the chances of democratic parliamentary elections in Ukraine this October for five reasons. First, in 2004 President Leonid Kuchma issued a highly detailed decree where he outlined plans to hold a free election in October of that year. Nevertheless, the 2004 elections turned into the most fraudulent in Ukrainian history against which millions protested in the Orange Revolution. Second, plans are already underway for election fraud, which will be coordinated through Andriy Kluyev who was appointed Secretary of the National and Security Defense Council (NRBO) on February 14. In the past he has been a behind-the-scenes “fixer” for the Party of Regions, buying up deputies in parliament in 2007 and 2010 and leaders of NGOs and political parties. The NRBO will coordinate the authority’s election campaign to ensure the “desired result” is received. In the 2004 elections, Kluyev headed Yanukovych’s “shadow” election campaign, which specialized in “black operations” against the Viktor Yushchenko campaign, and he appears on tapes made illicitly by the Security Service (SBU) where he discusses the organization of election fraud. At the same time, First Deputy Prime Minister, Kluyev was Ukraine’s main negotiator with the EU for the Association Agreement and he obviously has never understood the contradictions between undertaking Putinism at home and pursuing European integration abroad. When asked about the Yulia Tymoshenko case at the “Ukraine-EU Relations: the way forward” Brussels forum, Kluyev was unapologetic: “Criminal responsibility for crimes committed was irreversible”. Third, appointments of Ihor Kalinin, who served most of his KGB career in Russia, as SBU Chairman and Russian citizen Dmitri Salamatin as Defence Minister moves Ukraine further down the road of Putinization and toward a Russian-style militocracy. Although abuse of the SBU’s powers against the opposition took place under President Leonid Kuchma, this is the first occasion in Ukraine when the security forces have excessive influence and play a central role in upholding the president. Salamatin has a reputation as a thug who has been involved in numerous brawls inside and outside parliament. His appointment is aimed at placing the security forces under the control of “The (Yanukovych) Family” because Salamatin is ready to fulfill any order given to him by the president. Control over the security forces will be important in the event of Orange Revolution-style mass protests during the 2012 and 2015 elections. Fourth, skepticism is warranted because Yanukovych has made many promises to European and American leaders in the past that have never been fulfilled. 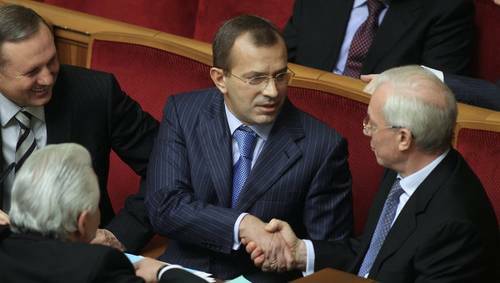 The dispute was in retrospect minor but Ukrainian and post-Soviet leaders are not used to being challenged by voters for not fulfilling promises. EU Ambassador Jose Manuel Pinto Teixeira reminded the Ukrainian authorities that Yanukovych had stated that he needed to concentrate power in his hands to fight corruption and undertake reforms to improve the business climate, but that this had not taken place. Fifth, Yanukovych cannot comprehend that the conduct of this year’s elections in many ways is irrelevant because the OSCE will be unable to declare them to be in accordance with democratic standards when opposition leaders remain imprisoned. In the aforementioned February 24 television interview, Yanukovych claimed that he approaches the opposition “with love,” and on the next day he said he remained committed to Ukraine’s European integration. Two days later, however, a Kiev court sentenced former Interior Minister Yuriy Lutsenko to four years imprisonment and a three year ban from public office. Lutsenko’s and Tymoshenko’s sentences are meant to remove them from the next parliamentary and presidential elections. After attending the Brussels forum, former Foreign Minister Borys Tarasiuk wrote that the only way to improve relations is to end democratic regression at home, “stop giving promises to the EU that are not fulfilled,” and respect the demands in resolutions by the European Parliament and the Parliamentary Assembly of the Council of Europe (PACE). Stefan Füle, European Commissioner for Enlargement and European Neighborhood Policy, told the same Brussels forum that relations are in a “critical state,” and that signing and ratifying the Association Agreement is dependent on Ukraine. In what Sonya Koshkina describes as a new “cold war,” many in Europe and Washington were deceived into believing Yanukovych wanted to prove he was a great reformer and integrator into Europe. This illusion was shattered by Tymoshenko’s and Lutsenko’s convictions and numerous broken promises to Europe, and is now leading to the threat of sanctions. Yanukovych was given a final warning by Secretary of State Hillary Clinton at the February Munich security conference, which he ignored, and the sentencing of Lutsenko went ahead. Earlier, US Ambassador John Tefft was denied the right to visit Tymoshenko in prison. A clash of civilizations exists between Ukraine’s neo-Soviet administration and the EU and US. In his televised February 24 interview, Yanukovych said that after Tymoshenko was imprisoned he never expected such “noise from any European country or the USA.” Yanukovych continued: “I did not expect that they would give us demands”. Yanukovych’s MFA and foreign policy advisers are obviously completely unknowledgeable about international affairs and the process of adapting to EU requirements in the process of European integration. Worse still, as former US Ambassador to Ukraine Steven Pifer suggests, Yanukovych and the MFA believed Ukraine was as strategically important to the West as Russia and that human rights infringements could be ignored. They were wrong on every count. Western policymakers, including seasoned diplomats, find it very difficult to comprehend Soviet newspeak – saying one thing and doing another. Here is therefore a word of advice: when Yanukovych says he wants free elections, think of Kuchma and understand he means the opposite.